Some heroes wear capes and have an arsenal of tools to fight crime hanging from their fancy utility belts. Other heroes, of the everyday sort, have different weapons at their disposal. To wit: one brave, mysterious shopper known only as “anonymous shopping cart guy” sacrificed his groceries to stop a fleeing suspect in Portland, OR. Our hero shoved his shopping cart in the path of a man who police were trying to catch, after he was spotted jaywalking, “nearly being hit by several drivers,” Portland Police said in a recent Facebook post. The suspect wasn’t injured, but he was arrested and charged with Disorderly Conduct in the Second Degree, Interfering with a Peace Officer and a parole violation. The mystery shopper righted his cart, picked up his groceries, and kept on shopping. 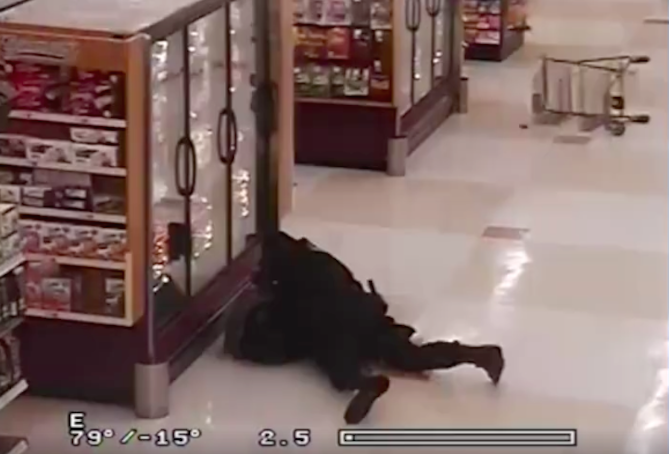 Police posted a video of the incident, saying that “[T]he officers wanted to thank him for sacrificing his groceries to stop a fleeing suspect.